the adventures of jo and dakota: M.I.A. I know, I've been Missing-In-Action the last couple of weeks. Mainly because there's been a lot of action to get lost in... which is a nice (albeit difficult) change of pace from a month ago. Mostly-Irish-Academics. Just finished my 4th week of class at IBI. I can't believe how fast the weeks are passing! My routine is becoming... well... routine. Up at 8 AM (make that 8:15). Dressed by 8:30. Sit on couch and eat oatmeal with raisins and peanut butter. Brush teeth and glance in mirror by 8:55. Re-do ponytail (one last time). Out the door by 8:58. Cross the street and catch the bus by 9:03. (Although this morning, the bus didn't come until after 9:10). Arrive at IBI by 9:15. Get coffee. Settle in for a full day of class and fellowship. Making-Intricate-Accessories. Denise, Juli, and I have rented a booth at a three-day craft fair the last weekend in November. Apparently it's a really big deal (which is why we entered it, naturally). Since quilts take way too long to make, I've been experimenting with some new "products." Mug rugs. Pillows. Zipper pouches. Surprisingly, I'm staying fairly organized and have managed to keep the inevitable creating-mess under control. Major-"Intraleague"-Achievements. Baseball playoffs are both exiting and stressful. Mostly stressful. And, unless it's an afternoon game, everything happens really late. It's way too hard to put the game on hold until tomorrow. Especially if the Rangers are losing. Or winning. Or have runners on base. Etc. By the time I'm finally done with the whole "just one more inning rigga-ma-roll", it's 2 AM and way past my bedtime. 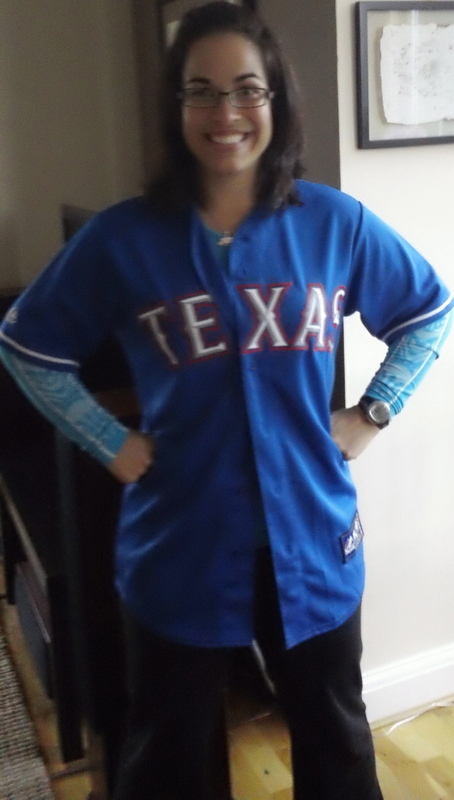 Luckily, tonight's game will offer me a few days of reprieve from all the playoff mania, since the Rangers BEAT THE RAYS AND ARE HEADING TO THE AMERICAN LEAGUE CHAMPIONSHIP!!!!!!!!! Miscellaneous-Irish-Activities. Including Friday night "block parties" at the Karnes, Sunday night worship, and Thursday morning coffee in city center with my new friend, Amy. Not to mention all the time that gets sucked up into the Dublin-Time-Warp to/from everywhere that must be gone. Also, I've joined a Crossfit gym to get me ready for this Tough Mudder race/obstacle course that I'm doing May 12 with Shay. I thought it'd be a good way to get involved and meet some folks. Now I'm thinking it's crazy and I must've been out of my mind. Oh well, God can work through insanity... right? Awesome post. All the MIAs are inspiring. you're pretty and skinny and blue. A wee bit of rain and the town shuts down.